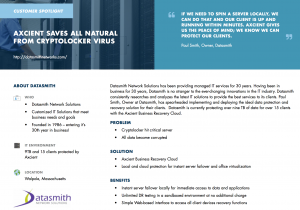 Datasmith’s client, All Natural, operates using two servers for critical data and applications reaching nearly 200 GB of data. It quickly became apparent that a reliable backup and disaster recovery solution was key to a successful IT plan for this client. “All Natural encountered a hit with the Cryptolocker virus,” said Smith, “All of their files and folders were being eaten up by the virus.” The Cryptolocker virus is unique. The virus can quickly be removed from the computer but the files remain encrypted and unusable. For this particular client, the Cryptolocker virus took over an entire server and all of the files became corrupted. 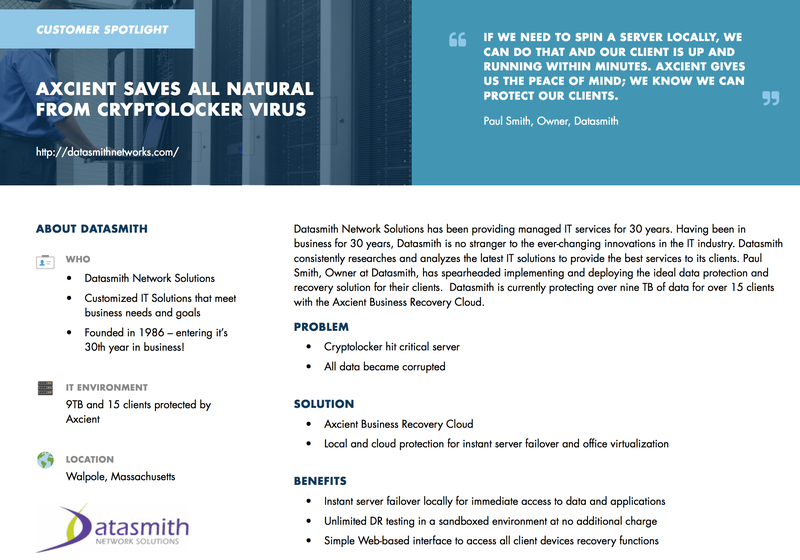 Since Datasmith utilizes Axcient, Smith knew that they would have no problem restoring and getting them back up and running with in no time. “It’s so easy to flip the Axcient solution on, I think people need to understand how beneficial that is. As a managed service provider, it’s ideal to get your clients up and protected as fast as possible,” said Smith. “It’s very easy for us to go into the Web-based interface and manage our clients,” said Smith. “If we need to do a failover, virtualize an office, or set up back-up jobs we can do that within minutes, it’s very intuitive.” Axcient also provides unlimited disaster recovery testing in a sandboxed environment. “We are going to start looking into DR testing, so we can ensure that we are providing our clients with the most secure and reliable solution in the market,” Smith concluded. Contact us to prevent your business from being crippled by a virus. Case study designed by Axicent. Download the full case study here.